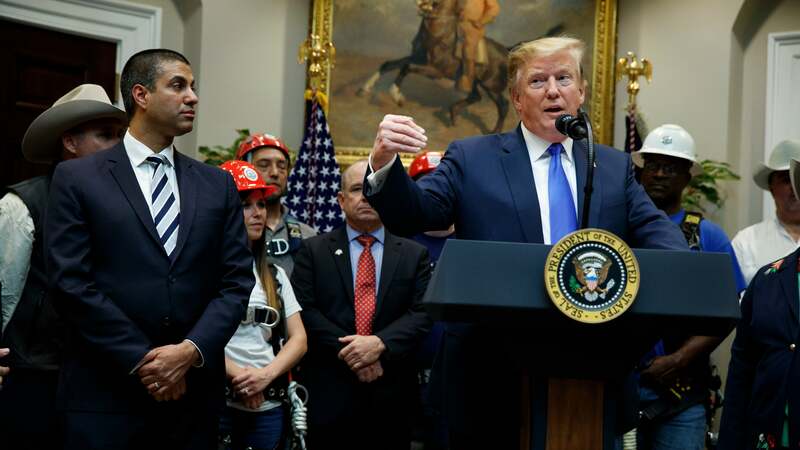 Last week, Donald Trump and the Federal Communications Commission announced a huge push to sell off up to 3.4 gigahertz of the millimetre-wave spectrum, part of a plan to speed the rollout of 5G technology. The president introduced the push by telling an audience at the White House that he will not allow “any other country to outcompete the United States,” promising the public “will have access very quickly to 5G, and it’s going to be a different life,” per the Washington Post. As Wired explains, 5G is supposed to result in mind-blowing 10 gigabit per second speeds that will make today’s wireless connections look like AOL, but it can only do that “by using uncrowded ranges of wireless spectrum that haven’t traditionally been used for broadband.” The millimetre-wave technology in question uses extremely high frequencies and is quite fast, but it hasn’t been used for broadband before because it’s easily blocked by things like trees or adverse weather conditions, potentially leading to low range and spotty signals. It also requires carriers to put access points all over the place. Industry groups have called for making more spectrum in the mid-band range available; these ranges have less bandwidth and are thus slower. But using more mid-band spectrum would make it easier to adapt existing cellular infrastructure for 5G as well as offer significantly expanded range. PC Mag wrote that more mid-band spectrum availability in the 3.4 to 7GHz range would help achieve longer ranges—citing one paper from Ericsson showing 3.5 GHz LTE would achieve 2,100 of range feet in line-of-sight, and 1,140 without line of sight — and help prevent carriers from having to install so much 5G equipment. Unfortunately, much of that mid-band spectrum is locked up or contested by everything from satellite companies to the U.S. military. 5G is promoted as having massively faster speeds and lower latency than 4G. That’s not because it’s magically more efficient; it’s probably 30 per cent more efficient per hertz of spectrum. The faster speeds come because 5G can use much larger channel sizes than 4G, which means it needs more spectrum. ... For 5G to change the world, it needs to run on big, broad slices of 100MHz or more... Huge chunks of spectrum are available up in the millimetre-wave ranges. Verizon has up to 800MHz in many cities; AT&T has 400MHz. With up to 3.4GHz will be auctioned soon, and you can bet T-Mobile and Sprint will get their airwaves, too. But that won’t matter for enough people if mmWave is too short-range for city-wide buildouts. Other countries, including most of Europe, are focused on mid-band 5G in the 3.5GHz band. It turns out to be easier to build mid-band smartphones than millimetre-wave smartphones, too. Both OnePlus and MediaTek told us recently that mid-band products from their companies will be coming before millimetre-wave devices. Sprint is the only U.S. carrier that has considerable mid-band spectrum to expend on 5G, owning “120MHz in the 2.5GHz band,” but because it needs to be shared with 4G, it won’t be able to fully offer the massive speed increases that 5G is supposed to offer, PC Mag wrote. It added there are other options, including CBRS in the 3.5GHz to 3.7GHz range, C-Band in the 3.7 GHz to 4.2GHz range, another range from 5.9GHz to 6.8GHz “targeted as an unlicensed band, for Wi-Fi-like services,” and “unlicensed bands in a system similar to 4G LAA, an existing system where 4G LTE runs over the 5GHz Wi-Fi band.” But many of those will either run into resistance from incumbent companies or run into mind-numbing levels of access management. According to Wired, the FCC is considering three future auctions of mid-band spectrum, though they have yet to issue a decision. The U.S. millimetre-wave auction begins in December. Meanwhile, both South Korea and China have made moves to auction off or reserve wide swathes of mid-band signal for 5G.